The National Gallery&apos;s Delicious Art Hamper brings together high quality gift food and drink, inspired by the magnificence of the National Gallery&apos;s collection. Each hamper is hand made to the highest standards; the quality of craftsmanship is exemplary with only the very best willow selected for the National Gallery. 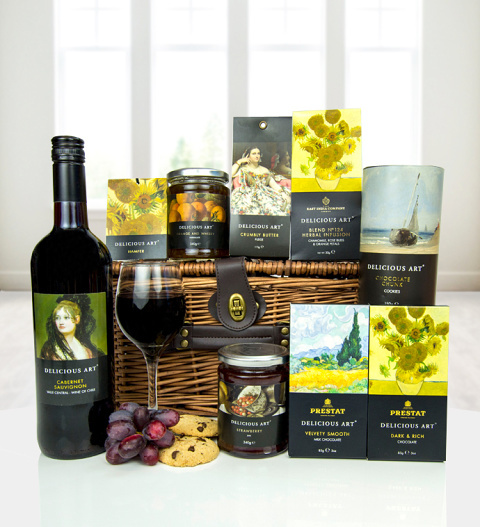 This luxury hamper is only available to purchase here at Prestige or direct at The National Gallery store. Perfect for those who love to indulge in exquisite wine, delightful chocolates, loose teas and gourmet conserves; The National Gallery Hamper is available for UK next day delivery.